Replace 250 or 400 watts Metal Halide. in maintenance with our LED WallPacks. 18W, 32W or 75W with 9W, 18W and 36W. Great for offices, parking garages, schools, hospitals, hallways, stairways, etc. Replace 175 to 1000W Metal Halide. Parking Areas, Strip Malls, Car Dealerships, Street Poles. Over 60% annual ROI. 150W to 250W Metal Halide, HPS or HID. From 8 to 120 Watt. Replace 50w to 400w. Warehouses, Parking Garages, Parking Areas, High/Low Bays, Lamp Posts. COMMERCIAL LED LIGHTING IS OUR FOCUS. 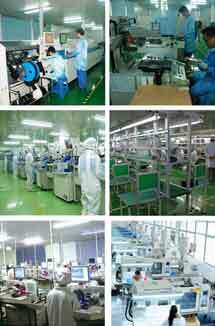 WE CARRY LATEST TECHNOLOGY QUALITY PRODUCTS. With 40 years in the electronic business, our fanaticism for product excellence has driven us to secure only the most technologically advanced and reliable components for our LED bulbs and LED fixtures. Simply put: we always use quality components. Added to this, our engineering process is so rigorous that creates an LED product of unparalleled longevity, reliability and durability. Cheap electronic products are always very expensive. Whether you are seeking LED corn bulbs to retrofit HPS, HID bulbs or LED tube lights to replace fluorescent bulbs, LEDRadiant has the products you need. We stock over 100 LED light types and we can manufacture nearly any LED product on spec. Maybe you decided it’s time to change the look of the area you are illuminating and want to update and modernize it. You can do this by changing the actual shades that hold your HID or HPS bulbs for our Aluminum or Acrylic ones or by installing a brand new fixture like LEDRadiant’s LED UFO’s. If you have a parking garage, a hotel entrance, or gas station pump island that has to be illuminated, we have a large selection of LED Canopy Lights, from 45 watt and up to 300 watt to take care of your lighting needs. Different color temperatures and fixture designs provide you with a hard to match palette of options ready to be chosen. Offices, hospitals, showrooms, warehouses, schools, workrooms, laundromats, retail stores, parking garages, and more are just an introductory small sample of all the different places where you can start a fluorescent tube retrofitting schedule and switch your luminaires to LED tubes. Even though there are (and we carry) LED tubes that are ballast compatible, if your goal is to maximize your savings, the best option is to remove the ballast, since it consumes energy in itself (around 20% of the tube that is feeding). The instant you switch from fluorescent to LED you automatically start enjoying LED benefits: forget about flickering, chose the color you want, stop handling hazardous substances and get a light that decays slowly over time, lasting more than 70,000 hours. Not to mention, you will reduce your maintenance costs near to zero! Keep in mind that illumination is one of the key factors to ensure that an environment is safe, secure, healthy, and ready for an optimal productivity. As such, the type and level of lighting you use will have a big impact hence the need to select the right lighting. Make sure you choose lights that can be placed strategically to ensure optimum performance and well-being for anyone working in the place. If you have a retail area, LED lighting looks much nicer, even and brighter which translates in higher foot traffic and sales. You can find other possible replacements for the old fluorescent tubes under the LED Linear Lighting category in our website: The linear high bays, with their different wattages (100, 150, 200, 225, 250, 300) that provide up to a whooping 40,000 lumens per fixture or the tri-proof linear lights, designed to withstand extreme conditions, like high humidity, dust and corrosion, ideal for walk in refrigerators, car-washes or other places susceptible to water, oxide and dust. Many warehouses, gyms, manufacturing facilities and other big spaces are usually lit with HID, HPS or Metal Halide bulbs, inside shades or reflective lamps at a considerably altitude. Whenever you decide that is time to start saving money and slashing your electricity bill by more than half, check our LED Corn bulbs section, whether you need them for outdoors (IP64 and up) or indoors (Less than IP64) applications. If the fixtures you currently own hold the bulbs horizontally and have a reflective surface on its back, you should consider as a replacement our Half or 180 degrees LED Corns: light comes out of the bulb in a 180 degree, front or downward avoiding this way the need of a reflective surface which would bounce back the light into the LED bulb itself making it hot and, since its opaque, wasting half of the lumens. Other replacement you could use in these cases are our LED Retrofit Kits, being the main differences with the Half corns that they have an external driver and a fan to cool it down. The more light you need, the happier you’ll be with our options! Need to illuminate a parking lot, a street, a car dealership, an outdoor venue, or that beautifully decorated big entrance to the condominium? Look no more. Our street lights (LED Pole lights or LED Mounting lights) are powerful options that you might want to ask us about. Specifically designed to stand inclement weather conditions such as rain, snow and even hail, our LED street light fixtures are a statement on its own. Added to that, they look beautiful...what else could you ask for? Need to work on the perimeter lighting of your building or facility to make it safer and more secure? We offer different LED wall-packs that will satisfy even the most demanding customers. Full Cut-off Wall-packs, Half cut-off wallpacks, Mini wall-packs. With or without motion sensor or photocell, plastic or glass...options are almost limitless. Let us know your needs and we’ll offer you the best fixture to take care of it. Also used mainly outdoors, are the LED Floodlights. These are broad beam lights extremely useful to illuminate large areas at night. They are usually found in Stadiums, indoor and outdoor arenas, sport fields, and many other large areas, including also driveways, streets, parking lots and warehouses. They are a great option for enhancing the security surrounding your property at night-time. You can also use them for decorative purposes; to light up outdoor parties and events held at night; to illuminate the walkways and steps leading to your front door, to avoid accidents when you come home late at night, and much more. When it comes to decorating, there’s a whole plethora of lights that can be used for this purpose. From LED Ropes and Strips, sold by roll or by foot and with color temperatures from 3000K to 6000K you can create the type of ambience you want. They come also in RGB flavor, with Red, Green and Blue LED chips that through their combining create colors options that increase exponentially. You can find also the LED PL lights, originally named for Phillips and nowadays replacing the inefficient compact fluorescent lamps (CFL). With a mirriad of different bases, color temperatures, wattages, orientation and lamp shapes to choose from, be sure that your next design project include some of these little lamps that, in the right places, can enhance dramatically the look and mood of a room. LEDRadiant has unparalleled prices for products that possess an outstanding quality. When it comes to fixtures being built, you will find companies that the only thing they have in mind is reducing costs in every possible way, which inevitably leads to a cheap, untrustable and no lasting “buy at your own risk” piece of lighting that usually end up in the trash because shipping it back, usually to china, cost more than the product itself or … it can be made the LEDRadiant way: With the BEST components of the industry to provide security, safety, functionality and design at the most affordable price. You need to make a decision that leaves you your mind and at ease? Let throw in there then a 5 year warranty so you can sleep sound at night knowing that LEDRadiant got you covered! Remember, in all cases our LED lighting fixtures and bulbs are designed to be a cost and energy efficient alternative to traditional lighting whether it is HID, HPS, CFL or INCANDESCENT, by using a fraction of the power consumption and lasting years longer. 480v? Again, you’ve come to the right place! Even if the product you want is not listed on our website, contact us and we will discuss timing and options to make a special order for you. LEDRadiant also serves contractors, electrical contractors, electricians, suppliers and other resellers by providing them wholesale prices on our products that allows them to have an interesting leeway in their pricing. For more information, browse to the Reseller Inquiry link and complete the form with your information. We will contact you within one business day, often within a few hours, to open or activate your account. Once you are approved as an LEDRadiant reseller, you can begin reaping the benefits of your reseller status immediately. Are you ready to start your own LED Revolution? Stop losing money now! Contact us today and speak to one of our certified LED technicians for a no-obligation ROI analysis of your facility or project. There’s absolutely NOTHING to lose, and absolutely EVERYTHING to gain. You are just a phone call or a couple of clicks away from the moment you will remember as one of the smartest moves you’ve ever done to save money!